The kitchen is the heart of the home. It is where the family is nourished and where they get and process food. The kitchen like the bathroom is also one of the most difficult areas of the house to maintain. Both areas have to be kept constantly clean because the health of people living in the house relies on these areas. This is why we have kitchen rugs to keep the floors of the kitchen dirt free and dry. 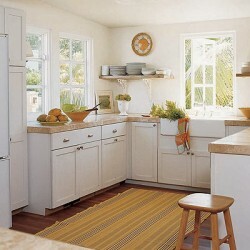 Kitchen rugs also define the space of the kitchen area at the same time giving it a decorative and stylish touch. However, we should remember that kitchen rugs are not rags. They may play an important part in keeping the kitchen clean and dry but they should also look presentable. Stained, filthy and dirty rugs can set a negative impression on the type of people we are in terms of keeping the kitchen clean. We do not want people to walk into our kitchen and find a rug that will make them lose their appetite. As much as possible we should keep the kitchen rugs clean and presentable. There are so many factors that prevent us from keeping our kitchen rugs clean. One would be the way things work in the kitchen. When things get busy and cooking in the kitchen more or less something gets spilled and the floor becomes an artwork of sauces. Sad to say, the most potential canvas other than the floor itself is the kitchen rug. We can never predict when a spill is bound to happen, so the best way we can take care of the kitchen rugs and keep them clean is to know how to effectively remove stains. Start by going back to the basic care procedures that come with the tag attached to the rug itself or the wrapper it came with. Immediately after a certain substance was spilled on the rug, try to prevent it from soaking further by patting the liquid using a cloth. Do not rub or push the stain and spreading it further on the rug. To easily get rid of the stain, use a pre-stain remover. This will loosen up the stain a bit more and will make it easier for you to remove the stain. When washing the rug remember to use warm water, also remember that the temperature of the water will depend on the color of your rug. Dark rugs need to be washed in at least 85 degrees while the lighter ones should be washed in water about 100 degrees. Use a mild detergent for both and rinse thoroughly afterwards. For drying the rugs it’s better to dry them by hanging than to use the dryer. This is so the fibers of the rugs won’t fall out and the rug will keep its structure. I also recommend hanging the rugs and letting them dry outdoors, they may develop odors along with mold and mildew if left to dry indoors. We can’t keep our kitchen rugs from getting stained, but being able to take care of the stains by washing them out properly can surely help in keeping presentable kitchen rugs.